Has anyone had experience in the SD brother of the ST generator series? This is the dual use welding/AC generating model. How does the unit make the DC for the welding? A whole seperate winding or via a rectifier? If it has seperate DC windings, I wonder if we can make it a starter like the Start-o-Matic? Interesting possibilities with this unit if it is wired the way we need. Though I suppose if there was anything in this someone would have already reported as such in this forum. Generators / SK Bushing Help!!! I am trying to get some QD- SK 38mm bushings for the ST5s to mount the Utterpower type Serpentine pulley. The shipping from the USA is expensive as no one will just send via normal post. Chinese suppliers want me to buy min 500 units. Does anyone know of a supplier of these anywhere in the world that is reasonable in price? Original Lister Cs Engines / Original Lister 12/2 Gold Bullion! Record sale price? What direction should the oil groove be placed when installing a new cam bush in the govener end? My original bush had oil groove at the bottom, but that doesen't make sense to me. I would have put the groove at the top to allow oil to splash in there and then let gravity and the spinning motion take over to spread the oil around in there. I am rebuilding my engine (Listeroid) and thought I would ask the original lister experts about this issue. Generators / ST Gen 3 phase to single phase conversion. Anyone know a trick to convert a 3 phase ST generator to output single phase? Sorry for the dumb question. I am a simpleton in matters such as these. I have been prepping my listeroid the "Utterpower Kit Engine Beta Test" method as documented by Quinn. Quinn has had great success when dipping cast iron, full of filler and paint, into a mixture of hot water and Drain Cleaner (Sodium Hydroxide). I have seen the photos that show a completely stripped cylinder block after 24 hours in the solution. When I try it, I get only minimal stripping after 2 weeks soaking!!!!!! The red oxide used inside the main bearing housings just wont budge!! I made a second batch of super concentrated mixture with only 4 inches of water in the bottom of a bucket. Still minimal success!!!!! Quinn bathed the whole crankcase in a plastic garbage bin and it worked a treat for him. I have a new ST-10 3 phase gen head. Unfortunately one of the slip rings have a lower "flat" spot. If I were to remove copper from the rest of the ring to even it out, it would make one ring smaller than the other. Conservativly estimating around 3 or 4 mm (maybe 1 or 2 16ths of an inch) removed all around. So I just want to replace the whole slip ring assembly. There does not appear to be any mention of the ring replacement in the archives of this list. Has anyone done this before? Is it hard? Listeroid Engines / Camshaft Endcap Anyone? On some Listeroids it appears that the govener housing has no camshaft endcap. Notice the exposed cam tip? Other listeroids have the bushing pushed further inside to allow for the included endcap. Anyone know the reasons behind the choice to include or not include the endcap? As promised to Petersbpus, I have finally posted a youtube video of my new Listeroid. I was so impressed by Quinn's kit engine report on the Utterpower website that I thought I would do a lame video equivalent of some parts of the new engine's dissasembly. It is not perfect by any means. In fact, hearing my broad Aussie accent is a strange phenomenon - especially because I thought my accent was not that pronounced. I am still learning a new thing each day! Again I say , not my best work, but it may be of interest to a one day Listeroid owner. I have lots of pics too but those are not yet posted anywhere. It in on my wife's uncle's hobby farm. He has it completely off grid at this "weekender". A great place to visit. I took delivery of a new Jkson 8/1 and I am now stripping it down to clean it out as per George's CD. (and Quinn's excellent kit engine report). I have to say that despite hours of reading and studying the CS design, nothing prepared me for the the great sense of satisfaction when I first took off the inspection cover and beheld that massive crank and con-rod!!! . WOW. This is some seriously heavy duty powerplant!! The sump was pretty clean and the crank case internal paint job supurb....but there was a little grit on top of the piston and on the Head Gasket. Also a tiny amount of scoring from grit inside an otherwise shiny new Big-End bearing. Also a slight horizontal scratch on the crank journal which I will polish out using the "shoe-lace" method. How do I remove the piston pin? That thing is sure in there tight !!! Or should I use the Quinn method of a 24 hour "Drain-o" bath. (I wonder what he did with the drain-o water mix when he was finished???). It is just that the paint job looks so darnn smooth. I have poked around and have found no sand pockets at all. Am I beeing fooled by the smooth paint? If a water blasting will remove it I will do that. The "acid" bath at this stage is not really an option for me. Other than the over use of body filler, I am pleasantly suprised that the machiening of the case/block/head seems pretty good and better than I expected. I was looking into a self starter arrangement for the Listeroids in the style of the Start-O-Matic...ie motor/generator in one. JTodd was looking into this kind of thing on his very neat set up, but it seems he abandoned this starting idea. Starter and Alternator in one. And as a bonus..... serpentine belt driven!! These kinds of starter/generator units are already employed in small engines like those in golf carts etc, but now they seem to have enough torque to start a hybrid car engine. It seems that they also use big versions of these in aircraft. One could use this arrangement to great advantage on a Listeroid/ST Genset. All we need now is a solenoid to operate the decompressor and we are nearly back to the start-o-matic days!! I wonder if it is powerful enough to start a lister without decompression? The serpentine belt certainly would make it a lot easier to ad a starter. No ring gears to worry about!!! Before I order, I thought I might just check with the experts out there to see if I am buying the right one. 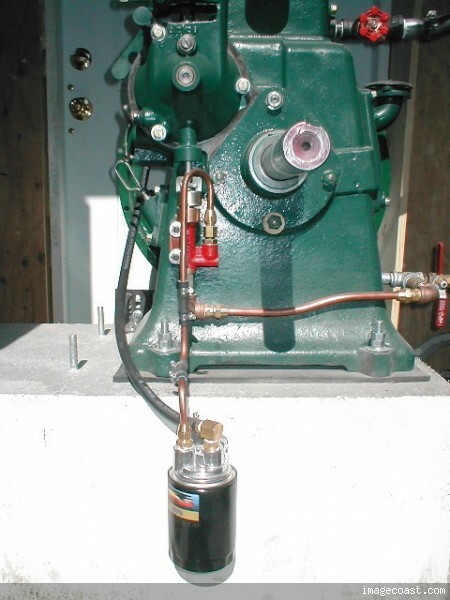 I am going to build a genset with an ST-5 kva gen head and will eventually run WVO or WMO or WHO (waste hydraulic oil). Many thanks to those who have shared their immense knowledge with the rest of us via this forum...it has helped me greatly! !